Falls are the leading cause of death in the construction industry, according to records from the state and federal Occupational Safety and Health Administration (OSHA). In addition, the Bureau of Labor Statistics National Census of Fatal Occupational Injuries identified that falls to a lower level accounted for 544 construction fatalities in 2012, the most recent reporting period. 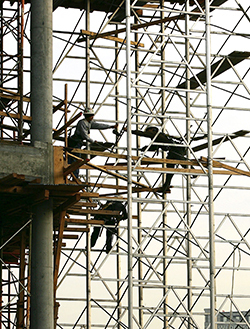 Three of the top 10 federal OSHA safety violation categories were in the construction sector. Fall protection—or lack of it—on the job site topped OSHA's list of most frequent citations with 8,241 incidents; scaffolding incidents ranked third in the number of citations with 5,243; and violations involving ladder use ranked seventh with 3,311 incidents. Construction safety resources are available from Cal/OSHA and the national OSHA office to help improve worksite safety and reduce injury. Cal/OSHA publishes a pocket guide that can be printed from its website that summarizes regulations in Title 8 of the California Code of Regulations that apply to construction and other industries. Free consultation services to improve construction workplace safety are available at the Cal/OSHA website. The federal OSHA, through the U.S. Department of Labor, also maintains a website section dedicated to improving safe practices in the construction industry. Safety training courses in construction also are available at certified OSHA training centers in California.